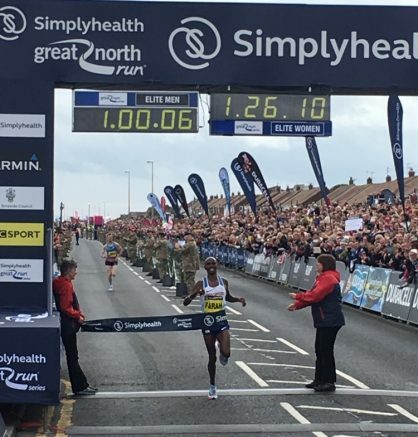 10th September 2017 – Sir Mo Farah (GBR) became the first man to ever win four Great North Run titles in succession with a trademark sprint finish down the coastal road of South Shields. After a cagey opening in which it appeared the leading entrants were content to watch each other it was Mo himself who put in the first surge around the 7 mile mark. This effort was followed by another from Olympic silver medallist Feyisa Lelisa and then another by Jake Robertson (NZL). It was Robertson and Mo who despite the best efforts of the New Zealander to drop Mo stayed locked together into the final 300m, when roared on by his home crowd Mo once again found the speed at the end to cross the line first in 60:06. Fellow Olympic Champion Vivian Cheruiyot (KEN) was also looking to defend the title she won last year but she came up against a very strong Mary Keitany on the occasion. Vivian took second place in 67:46, 10 seconds faster than the time she ran last year to win!